NOG has conducted a survey to try and identify all the types of orchard fruit which are grown in Newburgh. In addition to several types of Bramley Apple and Victoria plum, there are some less well known varieties. We have discovered that there is a special variety of pear, the Lindorsii, which is unique to Newburgh. In addition to the Lindorsii, there are Conference, Glasgow Yellow, Bon Chretien and Jargonelle. We have also found the Guthrie’s Taybank plum which is “large, yellow, sweet and tasty”. There are also Damsons, Bullace and Medlar. 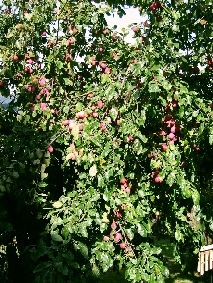 Of the eating apples there are Katy, Orleans, James Grieve, Worcester and Worcester Pearmain. Of t he culinary or cooking apples there are Stirling Castle, Grenadier, Tower of Glamis, Lane’s Prince Albert and Newton’s Wonder which will keep in a cool cellar until April.